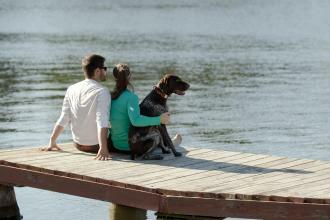 A trip Up North is a great place for your family to reconnect. There are tons of attractions and activities for everyone in your group to enjoy all together. With more than 2,300 waterways, you’re never far from a place to go boating, waterskiing, tubing or fishing, or to drop a line through the ice come winter. And beaches at Torpy Park, Clear Lake and Brandy Park are great for splashing around. Options for hiking, biking and snowmobiling abound on the area’s 600-plus miles of trails. But the Bearskin State Trail is a crowd-pleaser, with 18 easy miles meandering from Harshaw to downtown Minocqua. Wisconsin’s logging history comes alive each summer at the Fred Scheers Lumberjack Show in Woodruff. 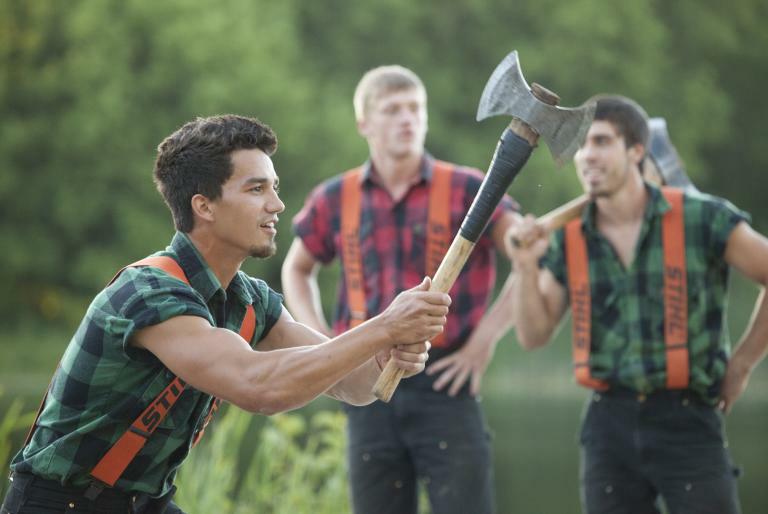 Watch competitors in log rolling, pole climbing, power sawing and seven other rugged events. Another seasonal must is catching a Min-Aqua Bats water ski show. A team of talented skiers takes to Lake Minocqua three nights a week to put on a dazzling and daring (and free) show. 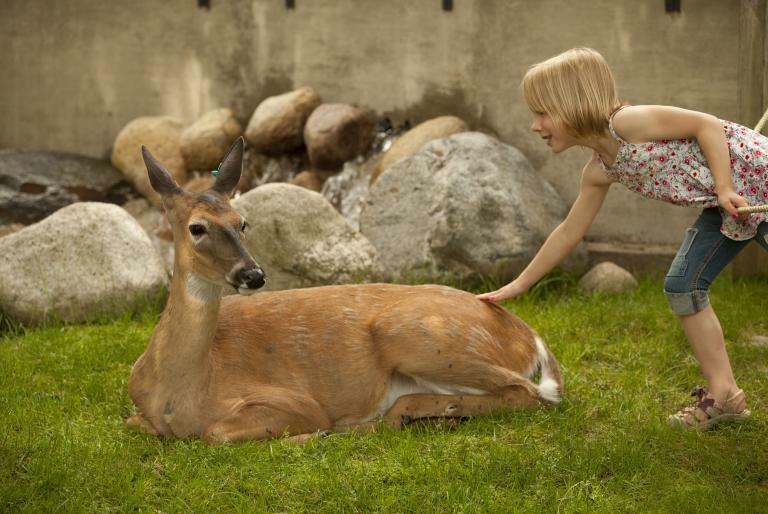 You might expect to glimpse a deer, badger or fox at the Wildwood Wildlife Park and Nature Center in Minocqua. 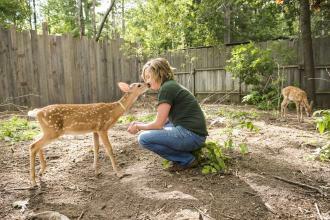 But the state’s second-largest zoo also boasts a host of other animals from around the world. Take a safari tram ride or get personal with the critters—pet a tortoise, cuddle a bunny, feed a bear or get a kiss from a kangaroo! Adrenaline junkies won’t want to miss Northwoods Zip Line. 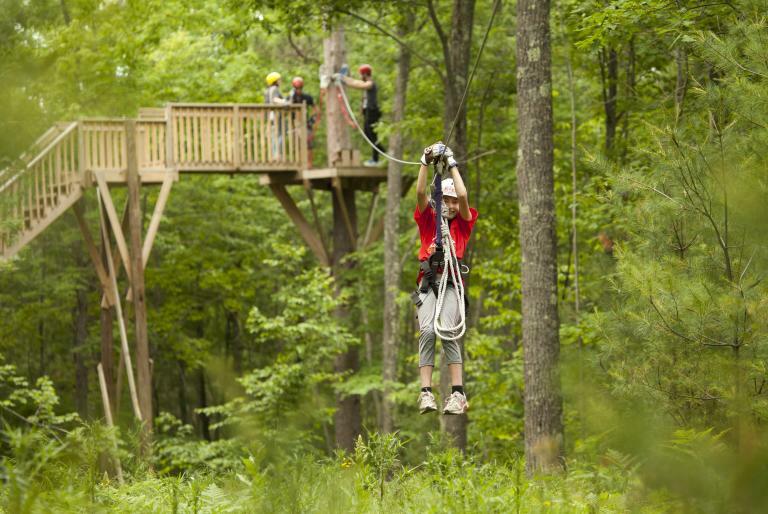 From 1,000 feet up, zoom past towering trees and cross adventure bridges. A kids’ course allows thrill seekers as young as three to take to the sky. The Minocqua outfitter also hosts aerial trekking and ATV off-roading tours. For a day on the water, check out Hawk’s Nest Canoe Outfitters. Rent a canoe or kayak, or for a more relaxed pace, a tube. Trips are available on the Wisconsin River, Turtle Flambeau Flowage, the Manitowish River or a number of other locations. Up for a game of mini golf? 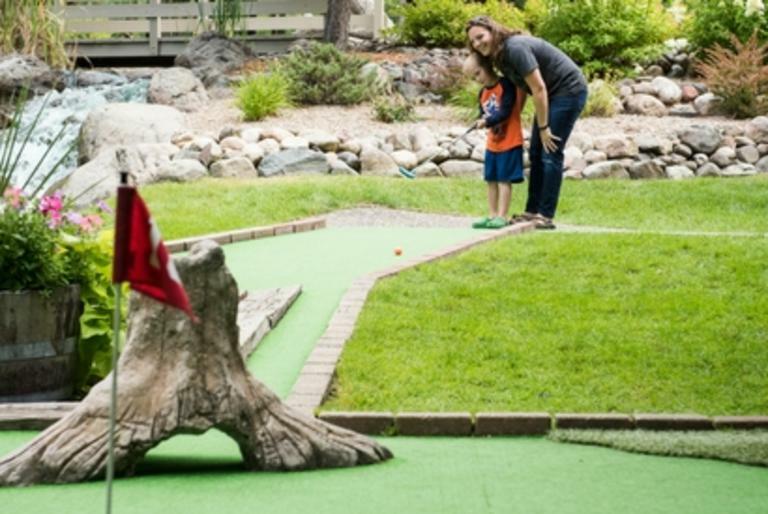 Look no further than Island Golf, offering 18 holes in downtown Minocqua. And at Rock Falls Riding Stables, Mini Golf and Go-Kart in Arbor Vitae, follow a challenging 18-hole round with a spin around the go-kart track or a horseback ride on a scenic trail. Three fantastic organizations get kids playing, exploring and learning. 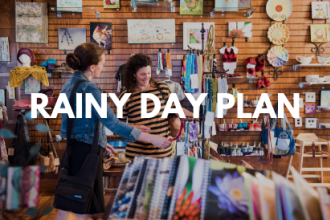 The NORTHWOODS CHILDREN’S MUSEUM & DISCOVERY TOY STORE in Eagle River promises hands-on fun with more than 20 interactive exhibits that delve into science, nature and history and incorporate everything from bubbles to black lights to birds. Over in Manitowish Waters, the NORTH LAKELAND DISCOVERY CENTER fosters connections to the natural world through a nature nook and tadpole classroom, and self-guided activities like geocaching and a 22-station birding trail. And the GEORGE W. BROWN, JR. OJIBWE MUSEUM & CULTURAL CENTER in Lac du Flambeau celebrates Ojibwe history and culture with seasonal workshops and exhibits showcasing birch bark canoes, a world-record-holding speared sturgeon and traditional arts, crafts and clothing.